Seattle Mayor Jenny Durkan proposes new and expanded shelters with a one-time sale of city-owned land. 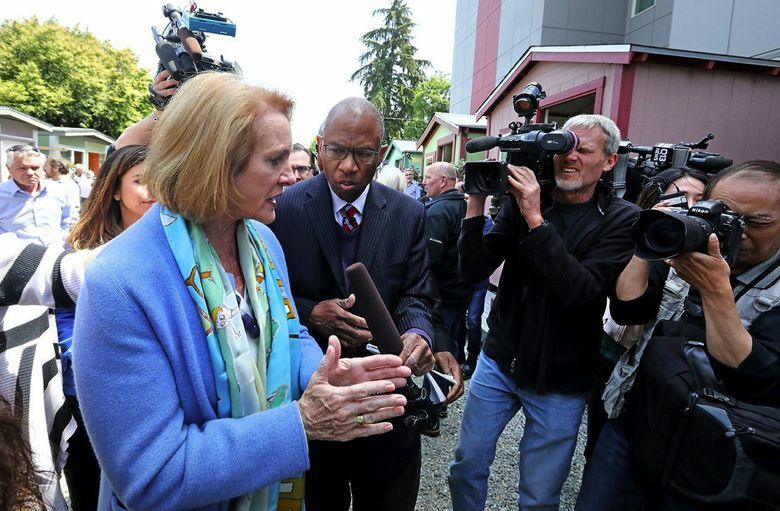 Seattle Mayor Jenny Durkan is planning a “surge” in new shelter capacity for the homelessness crisis with the proceeds of a pending sale of city-owned property in South Lake Union. Under Durkan’s plan, which is pending Seattle City Council approval, $6.3 million would be used to create about 500 new beds in basic and enhanced shelters, as well as more tiny-home encampments. Seattle currently funds about 1,780 shelter beds, not including spots in its six sanctioned encampments and tiny-house villages. An additional $2 million will go toward a two-year pilot program to prevent low-income renters who are waiting for federal housing vouchers from becoming homeless. The new spending on shelter capacity comes as Durkan and the Seattle City Council are still considering how to spend $45 million generated by a controversial new tax on large businesses. Businesses are funding a referendum campaign to put the tax up for a public vote this fall. The new beds would be funded with one-time proceeds from the sale of a city-owned communications shop, but Durkan said the city would look for other resources to maintain the expanded shelter capacity in the next budget cycle. On Wednesday, Durkan detailed the planned new shelter beds without also releasing data about how effectively existing city-funded shelters were at moving people into housing. Last year, Seattle rebid its shelter contracts with new performance targets requiring providers to more than double the number of people who left homelessness, ideally for homes. Speaking to reporters Wednesday, Durkan said providers are meeting performance requirements, though she did not provide specifics. Seattle said it plans to release that data later this week. The plan is latest signal of Durkan’s attempt to marry long-term and short-term solutions to getting people off the streets and out of homelessness. The Seattle City Council earlier this month adopted — in a 5-4 decision — a nonbinding spending plan for the new business “head tax” revenue, which puts a majority of the money toward a longer-term strategy to build affordable housing. Durkan has favored a more immediate approach, focused on getting people sheltered quickly. The mayor’s broader plan could pay off with residents frustrated over failed attempts to reverse rising numbers of homeless people on city streets. Both sides agree that no one approach is the right one, saying effectively addressing homelessness will require an array of solutions. Emergency shelter beds were full more than 90 percent of the time last year, according to data from All Home, King County’s homelessness services coordinating agency. The lack of shelter beds has partly slowed Seattle’s efforts to remove and clean up unsanctioned tent camps — estimated at 400 citywide — because city rules require shelter and services to be offered first. The proposed new beds in Durkan’s plan would include expanded capacity at a Mary’s Place shelter for families on Aurora Avenue North, and at a tiny-house village for women in Whittier Heights. New shelters would be cited at the Haddon Hall building on Third Avenue in downtown Seattle, at a new tiny-house village at 18th Avenue and East Yesler Way and other locations, pending City Council approval.